Steven G. Bowman is a native Virginian who has resided in Smithfield, Virginia since 1982. He is happily married and the father of two wonderful sons. Commissioner Bowman graduated with Department Academic Honors from Christopher Newport University with a Bachelor of Science degree in Governmental Administration. Commissioner Bowman joined the Virginia Marine Resources Commission in 1992 as Deputy Chief of the Law Enforcement Division. He was promoted to Chief of Law Enforcement in 1996. In 2006, He was appointed Commissioner of Marine Resources by then Governor Timothy Kaine. He was re-appointed in 2010 by then Governor Robert F. McDonnell. Commissioner Bowman retired from the Marine Resources Commission in 2012 and was appointed Chief of Police of the Smithfield Police Department. 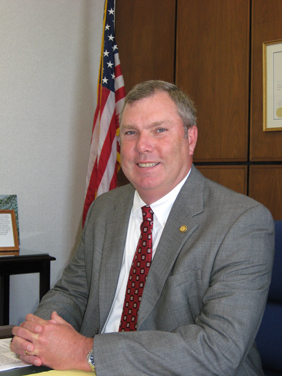 Commissioner Bowman departed that post in July, 2017. In March of 2018, Mr. Bowman was again appointed Commissioner of Marine Resources by Governor Ralph S. Northam. Prior to joining the Virginia Marine Resources Commission, Mr. Bowman served in numerous law enforcement capacities. He is a former Trooper with the Virginia State Police as well as former Chief-Deputy of the Isle of Wight County Sheriff�s Office. Commissioner Bowman is a graduate of the University of Louisville�s Southern Police Institute and Virginia Executive Institute. The Commisioner can be contacted by email at Steve.Bowman@mrc.virginia.gov.